Aeromotive’s Universal Fuel Tank Sump Kit is the most advanced sump kit available “anywhere”. It features internal sidewalls designed to extend from floor to ceiling, acting to continuously capture and hold fuel at the pickup point, even during hard cornering and braking! This “universal” version of Aeromotive’s 2nd Generation Mustang tank sump is a state of the art, weld in sump, ideal for any EFI or carbureted application where fuel slosh control is vital. Large, captured sump design is baffled to hold over 3.5 Gallons of fuel at the pickup point at all times. Return fuel is directed into sump to maintain drivability when main tank is low. 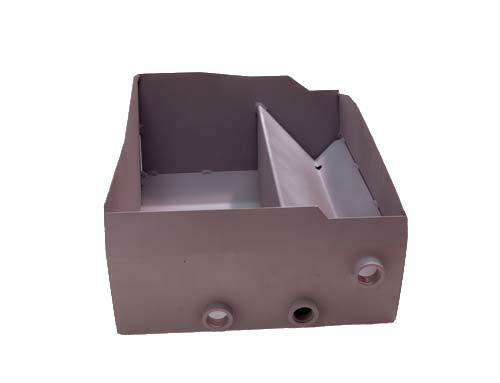 Special return baffle prevents aeration and turbulence in the sump. Two (2) -10 AN ORB outlet ports and one (1)-10 AN return port. AN ORB adapter fittings sold separately. Extra tall sidewalls allow the sump to be custom fitted to various fuel tanks for optimal slosh control. 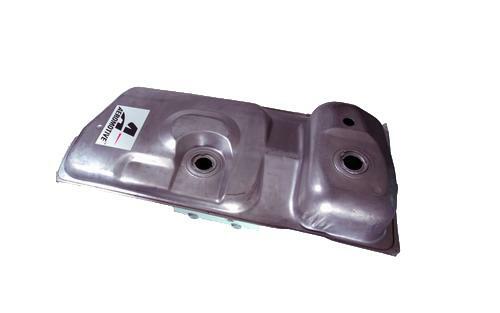 This is the most advanced, weld-in fuel tank sump ever offered to the public. Skilled fabrication and welding are required. Installation by a trained, professional fabricator, beginning with a new/reproduction steel fuel tank, is strongly recommended. Restrictive fuel inserts or “pick-up tubes” for external pump supply can cause cavitation, vapor lock and premature pump wear. Aeromotive’s Baffled Sump Tank for Fox Body Mustangs eliminates these problems. There’s no need to try and engineer a proper baffle box, weld a used, rusty tank or build a fire-wall and give up your cargo space for a fuel cell. Features an advanced EFI sump design with a large reservoir volume, floor to cieling baffling and proprietary return ramp to insure a constant head of fuel at the pump’s inlet, right down to E-empty. Equipped with two -10 AN female ORB outlet ports and a -10 return which can be reduced to -8 or -6 AN with the correct adapter fitting. Can be used with any manufacturer’s external fuel pump. Requires no chassis or floor pan modificatins, utilizes the stock filler neck/door, fuel level sending unit and tank mounting straps. Easily adapts to ‘79-’86 Fox Chassis Mustangs, requiring the later ‘86-’98 fuel level sending unit as the only modification.